As I see it, there are two ways to be a Creature of Habit: through your big lifestyle choices, and through your everyday routines. Today I will focus on the big stuff, and tomorrow on the little stuff! First up are your huge life choices – such as education, careers, relocations, partnering and child-rearing. Each of those can involve big risks. More often, a slow accumulation of choices eventually becomes your life! But no matter how many leaps you take into the unknown, The Everyday catches up with you. So where does your caution-versus-risk ratio start? First, with temperament: are you a drama queen? A bean-counter in training? Next, with encouragement: were you nudged toward new goals, or held back with an iron fist (or worse yet, tears?) Is your life on a plateau right now? Are you climbing or coasting? Expecting changes or avoiding them? I have always loved order and symmetry and anticipating the comforts of the known. My idea of discovery is finding out something new from a book or a phone call or out on a walk…not quitting my job at the spur of the moment to spend 6 months in Thailand! Dar = spontaneous and unpredictable: I think not! For me, a risk might be starting a new job, bringing home a new kitten, or, harkening back to 2008, marrying someone from the UK that I met online 🙂 In between these Big Leaps, I am a mild-mannered librarian. I don’t expect to be facing any major changes for a while, so I am coasting. While it lasts. What is your Stodge Factor? I think mine is 10. Here are the things that make me boring. This may even be an abbreviated list. 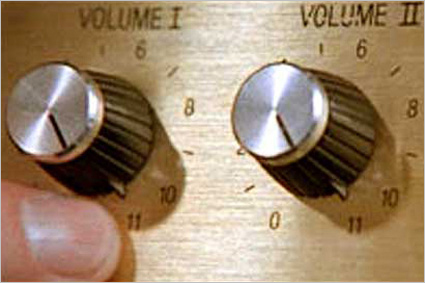 Maybe my stodginess goes to ELEVEN! I work 9 to 5. I have to take care of a yard and two pets. I visit my parents and other relatives regularly. My idea of entertainment is reading books and watching movies. I keep my house both clean and organized. I wear a lot of black, brown and grey clothes. I bring lunch to work every day and cook dinner every night. If I try to watch TV, I fall asleep. Every time my contract job ends, I shlep around to find another, and put off paying bills for a while. I’m single, because I want to keep my options open. I don’t get too attached to anyone, because I might be closing the door on someone I haven’t met yet. I like my apartment but I have to be home on Wednesday nights because that’s my assigned time slot for the laundry room. My house plants keep dying. I had to give my cat away because I’m never home after work. I drifted away from my family after I left home. My idea of entertainment is karaoke on the weekends, and bungee-jumping in New Zealand whenever I can afford it. My place is a wreck, but who cares – I’m never home! I spend half my income on my wardrobe, because I like to be seen. I order in and eat out as much as possible because cooking is so tedious; plus, everything I buy just spoils before I have time to cook it. I fall asleep with my laptop in bed at 4 a.m. Which life would you prefer? I will take stodgy any day! Or rather, I think the second life is stodgy. It’s just cool stodgy. On a more serious note, I think it comes down to what is more important to each person, freedom FROM or freedom TO. The greater focus might be on avoiding commitments or on keeping commitments – both of which can be very important at different times in your life. 4. I bring lunch 4 times a week with a planned outing with a colleague pre-negoiated! 5. I pay all my bills on time or early! 3. I still want to climb the harbour bridge, and fly first class, and do crazy stuff! Thanks for the post – loving it! Great list! Later today I have more to say about the “adult” thing!